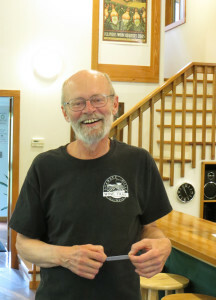 George Majka, owner and winemaker at Pomona Winery, built the second post Prohibition winery in Southern Illinois in 1989 and was licensed in 1991. “We learned to make fruit wine because there were no grapes available in the area at the time,” he recalls. When Pomona Winery opened there were two other wineries in Southern Illinois, Alto Vineyards and Owl Creek Vineyards. Today, there are at least 28 wineries in Southern Illinois. As with any growth industry, competition is changing the business landscape. Heritage wineries like Pomona, Alto and Owl Creek have been forced to adapt to competition from new wineries with larger and more elaborate facilities. Recently, Alto and Owl Creek have undertaken major expansion projects to position their wineries for the more entertainment oriented experience today’s wine tourists are seeking. For Southern Illinois wine, a watershed occurred in 2005 when Blue Sky Vineyards opened. To the surprise of many, local estate magnate Barrett Rochman built a $3 million Tuscan Villa style winery in the middle of the vast Shawnee National Forest. Considering the remoteness of Blue Sky Winery and the size of the industry at the time- Hedman Winery had just become the sixth winery on the Shawnee Hills Wine Trail- Rochman’s new destination winery was a bold move. But the risk paid off. Today, Blue Sky Winery produces 18,000 gallons of wine per year. The winery hosts 30 weddings a year and the tasting room is one of the busiest on the Shawnee Hills Wine Trail with approximately 600 paid tastings on an average weekend. With an attraction like Blue Sky as a magnet, Southern Illinois wine tourism skyrocketed. Sixteen wineries have opened in Southern Illinois since Blue Sky’s debut. However, no fewer than four area wineries have also closed in recent years. Some winery closings have been the result of owners retiring, but there is no doubt that the bar has been raised in regard to the competition for wine tourists. 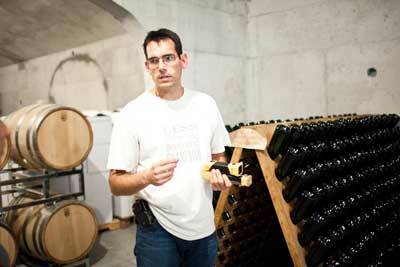 During 2012, Rustle Hill Winery, which is several miles south of the second largest university in Illinois on a main highway, underwent a major expansion. The project nearly tripled the size of the winery, adding a 1,000 square-foot kitchen, a 1,000 square-foot gallery, a gift shop and a balcony, plus deck and patio expansions on three sides. Seating for outdoor concerts was also increased to 3,000. Rustle Hill now books more than 3oo music shows a year and is open from 10:00 a.m. to 9:00 p.m. Friday to Sunday and 11:00 a.m. to 8:00 p.m on other days. Another local winery, Walker’s Bluff Winery near Carbondale, has recently expanded to become the largest winery complex in Illinois. 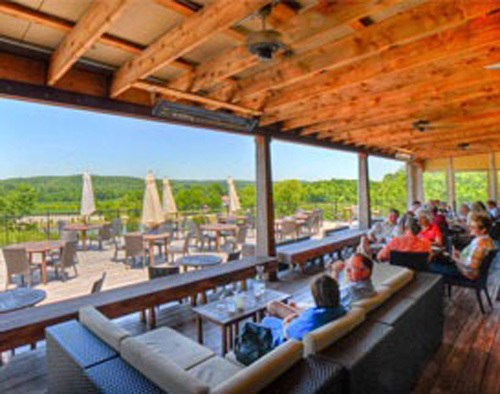 During 2012, Walker’s Bluff opened their tasting room which is part of a 160 acre entertainment campus that includes a wine cave and outdoor amphitheater for concerts. According to the contractor who did the work, the VIP Tasting Room table, which is in the wine cave, is the longest continually poured table in the U.S. at a length of 90 feet. Walker’s Bluff owners, David and Cynde Bunch, plan to build a 100 room hotel and convention facility on the property next year. From a viticulture standpoint, Walker’s Bluff is also a trailblazer. They are the first commercial winery in Illinois to bottle a variety of estate grown vinifera wines including Pinot Gris. A new 5,000 square-foot indoor wedding, concert and tasting room facility is set to open at Alto this summer. The old tasting room will become a museum devoted to founder Guy Renzaglia and the history of Southern Illinois wine. This fall, Alto will also be hosting 25th anniversary celebrations. A new bottle and logo design using clear labels is in the works to commemorate the milestone. 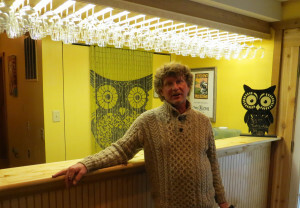 The other original grape wine producer in Southern Illinois, Owl Creek, opened a second tasting room this year on the first floor of the winery. In addition, Owl Creek is expanding its product line, aiming to be Southern Illinois’ first major hard cider producer. Brad Genung of Owl Creek Vineyard in the winery’s new tasting room. Owl Creek now makes about 12,000 gallons of wine and 6,000 gallons of cider each year. An in-progress expansion of Owl Creek’s production area will give the winery the capacity to press 20,000 gallons of apple juice a year. Owner Brad Genung has been working for several years to source local heirloom apples from which to make his ciders. “We are putting enormous resources into cider so it will take off,” he said. Before Prohibition, Illinois was the fourth largest wine producing state with production centered in Southern Illinois below 37 degrees North latitude which is a 6b/7a USDA growing zone. Unlike other areas which were allowed to make wine for sacramental purposes, the Southern Illinois commercial wine industry was completely destroyed in 1920. The resurgence of Southern Illinois wine is a remarkable success story thanks to the sacrifices of the original “pioneers” and the contributions of thousands of grape growers, winemakers and winery workers.